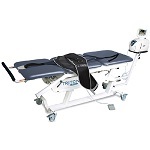 Tractions are a blanket category of machines which are used in physical therapy in order to relieve and stretch lumbar (back) and cervical (neck) vertebrae, as well as the limbs, to aid in the recovery of repetitive stress or traumatic injuries, especially after reconstructive surgery. Tractions can be vertical or horizontal, designed specifically for the neck or the spine, or both; or, specialized versions for the extremities of the body. Mechanical wear, as well as improper adjustment of various settings. Tractions vary in their complexity greatly, from simple pulley-and-cradle devices to advanced electronically-controlled ones. We are able to service all types.